The Eclips Minimax is a folding bariatric wheelchair with all the right features. It is suitable for users up to an impressive 325kg or 51 stone in weight. 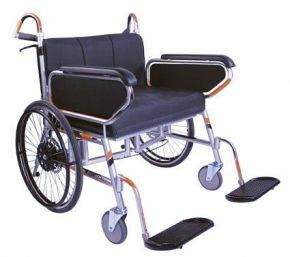 It folds away for easy transport or storage (important in a bariatric wheelchair as these tend to be wider and heavier than standard models). Despite the folding action, the Minimax wheelchair is exceptionally strong and rigid. The seat is heavily padded to provide comfort to very heavy users, and the front and rear wheels are carefully positioned for stability and manoeuvrability. 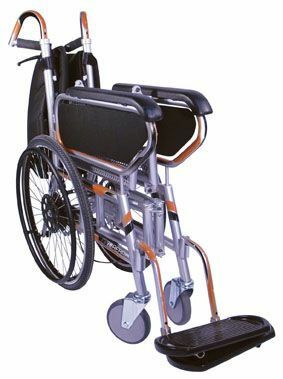 The front castors are further forward than they would be on a standard wheelchair to prevent tipping, and the user's centre of gravity sits further back over the rear wheels, taking most of the weight. This makes the chair easier for a very heavy user to propel. The padded attendant handles are also designed to aid manoeuvrability and reduce strain on the carer. The seat height is relatively low, balancing the need to self-propel with safety and ease getting into and out of the Minimax wheelchair. Extra long, padded armrests also help here. Each footrest can support up to 100kg, and are adjustable for the comfort of those with larger, heavier inner thighs.